"So How Much Will It REALLY Cost Per Square Foot?" Cost per square foot is probably the single most important question to ask when building a home. 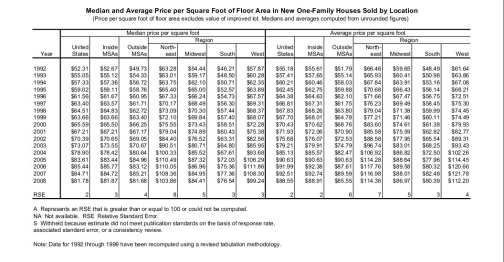 The chart below shows the average price per square foot in a new one-family house in the United States in 2008 was $81.78. This does NOT include the value of the lot/land. Estimating the cost per sq.' for your home BEFORE you buy your land or begin the process of building is a critical part of your plan to succeed. If this step isn't done properly, you will find yourself in a mess. Begin by checking out the prices of some custom homes being built in your area. Find a few that are similar in size, style, and the quality of what you want to build. If there are other lots or land not built on in the area, get that information too. You can also check the county tax records to see what that lot cost the builder when he purchased it. What you have left equals the Estimated Cost To Build. Divide this number by the heated square footage of the home, and you have your cost to build per square foot IF you do your own labor and be your own contractor. You could add back in the 5% Real Estate Commissions if you don't intend to sell you home, which means you could have a whopping 55% equity in your new home!